The Spider: Using SteamVR dev kit for creating a glasses tracker. In the lab, I have been working for some time with a SteamVR tracking dev kit we got. I started a small project of creating trackable shutter glasses so we can use on our VR experiments. I have been trying to write about this for a while but finally I could find some time todo this! 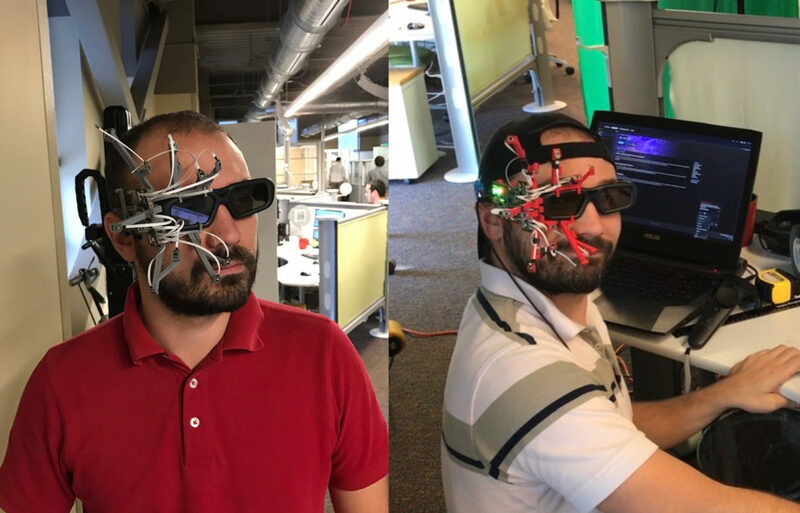 On this post I’m going to write about how we created in the lab a trackable prototype frame that uses SteamVR that gets attached to our shutter glasses for our projects here at the EAC. If you are more interested on how we did this / more details on the whole workflow for doing just to write me an email and I will try to explain with more detail. The Steam VR tracking system is a system based on timing, the wireless connection uses a proprietary protocol and the only difference between a controller and a HMD is that the HMD has a display, besides that, the way it works is exactly the same. The system uses 2 bases stations to track objects. These basestations are called “lighthouses” and need to be synchronized either by wire or by flashes (if the lighthouses are in the field of view from each other). These lighthouses contain 2 motors that spin at 60Hz (one Horizontal and one Vertical), they produce IR signals modulated at 1.8Mhz generating time stamps at 48Mhz. The difference between the synch flash from the light houses and a laser hit on the tracked object sensors generates an angle. These angles plus some precisely timing produce an equation system that provides the position and rotation of the tracked object. Each tracked object contains a set of optical receivers; these optical receivers detect reference signals from the base stations and with a photo diode, they convert IR light to a signal that the FPGA in the tracked object understands as a hit. The FPGA then uses ticks to calculate angles between laser hits from the basestations plus the known position of each sensor to generate the equation system that solves the position and rotation of the tracked object. In order to design the spider we had to take into account several factors. The tracked object had to be light, it shouldn’t occlude the view from the glasses it was going to be attached to and the sensor placement should be positioned taking into account translation and rotation errors that can arise. Translation errors: These type of errors arise when the tracked object is being moved around the tracked area. As the distance from the lighthouse increases, the tangential velocity from the spinning motors in the base stations also increases hence decreasing the time between sensor hits. Then the error begins to dominate, in order to avoid this type of error the sensors should be as far apart as possible. Rotational errors: These errors arise when the user is rotating the tracked object. Rotation of sensors orthogonal to a plane yields significant displacement while rotation in a plane yields less displacement, in order to avoid this type of errors sensors should be out of plane. In order to achieve these requirements, we decided to 3D print a structure that “hooks” itself to a set of shutter glasses taking into account the limitations on sensor placement we mentioned above. After 3 iterations, we came up with a final prototype that complies with all the aforementioned requirements. After designing the frame with all the specific positions of each sensor we ran our generated model through a simulator that the SteamVR provides that assesses how good or bad tracking the proposed model has. 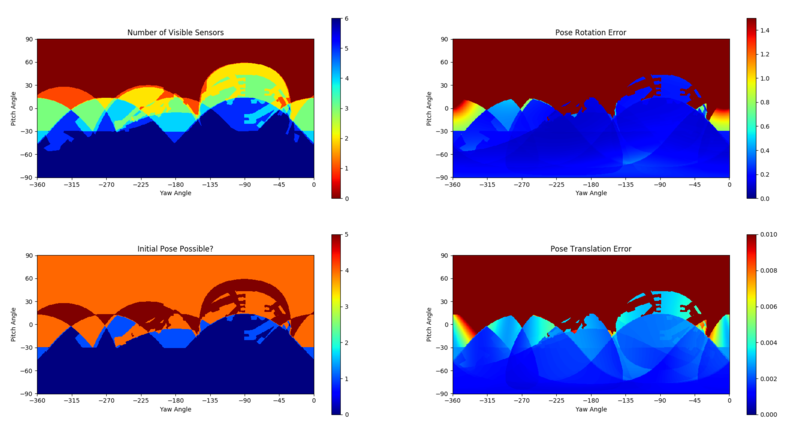 Each view shows a translation error, a rotation error, an initial pose view and the number of sensors that are possible to view from a specific view. Also, each view shows colors that go from blue (good tracking) to red (tracking not possible) and in our case, we only need to track the front of the glasses (as is where the user is looking at in the projection screen). 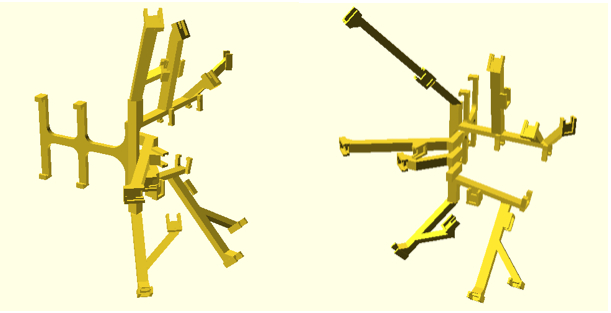 As one can see in the 3D figures the front of our tracked object both for rotational errors and translation errors shows good results. After 3D printing the different parts, positioning and calibrating the sensors and the IMU (gyroscope) for the tracked object, we gave it a few tests and so far it works promisingly. You are currently browsing the Pencil Square blog archives for August, 2017.